In the same week, a second news item, related but distinct, emerged: Specifically, that the Democratic Socialists of America (DSA) had surpassed 25,000 active members — an increase of around 17,000 since I joined in 2012. This makes the DSA the largest socialist group in the United States since the 1940s. These two events are related, though perhaps not as you might think. And to understand why we have to turn back to Daou’s comment. Historically, the Democratic Party has not been threatened by those who stood to the left of it, as Daou implied; rather, those groups created it in its modern incarnation. Indeed, positions and programs like Social Security, Medicare, civil rights and reproductive rights came about because workers and activists, many explicitly socialist, organized and fought for such causes. The Democratic Party of yore sought to capitalize on their movement-building by taking up their mantle. [T]he incoming Roosevelt administration had relatively little to offer working people. Its signature effort, the National Industrial Recovery Act, aimed to revive industry by propping up capitalist prices and profits through cartels and monopolies. But it could not make a dent in the economic crisis. [. . .] In November 1934, the Democrats achieved a crushing landslide victory in the midterm congressional elections, increasing the electoral majority they had achieved in 1932. Democrats at the radical end of the political spectrum were elected in disproportionate number, and even a few socialists came to office. Newly active workers entered into urban politics and joined up with the Democrats. . . . Roosevelt was transformed from a standard politician into a reformer, the carrot and stick of the new labor movement inducing the administration to advocate a series of historic sociopolitical reforms that included the Social Security Act, the Fair Labor Standards Act (which set maximum hours and minimum wages for most workers), and the Wagner Act (which extended union recognition and set up routinized collective bargaining). Hence, Roosevelt would not have proposed and passed the New Deal without the outside pressure of the American left, which was radically (pun intended) popular at the time. “[The United States] adopted a modified socialism, like a vaccine assimilating a weaker strain of communism in order to immunize against it,” writes Jeffrey J. Williams in "How to Be an Intellectual." If democratic socialists like Sanders and Seattle city council member Kshama Sawant become a mainstream force in American politics, we may end up with a 21st-century New Deal. (Though most likely this would have to happen in concert with a revived labor movement and on-the-ground organizing efforts from groups like the DSA.) Likewise, if the Democratic Party doesn’t wither away under the weight of a decrepit neoliberal elite, it seems probable it will absorb much of the socialist left’s policy proposals once again, perhaps “assimilating” a strain of socialism, as Williams wrote. Peter Daou is wrong when he says that Berniecrats are hijacking the party. Indeed, the Berniecrats’ predecessors — call them Eugene Debsocrats if you must — made the party what it is. Saying that Berniecrats are ruining the Democratic Party is like saying Rock and Roll was ruined by R&B — when in reality, it evolved from it. It is tempting for liberals to see Sanders, DSA and their ilk as the enemy, rather than the vanguard, in the ongoing trials over the future of American liberalism. Yet the alternative is to fight for the status quo: endorse and line up behind other neoliberal Democrats like Sen. Cory Booker, N.J., Sen Kamala Harris, Calif., defeated Georgia congressional candidate John Ossoff, and perhaps even Facebook CEO Mark Zuckerberg. Yet this impulse will surely lead to ruin. 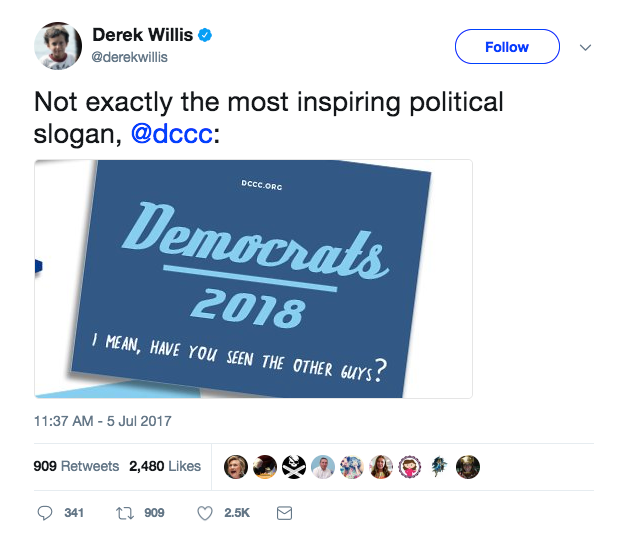 Indeed, the Democrats lost their way in 2016 by capitulating to Clinton's stale, empty vision of the future. Indeed, in a July 2017 poll, 52 percent of voters polled said that the Democratic Party stood for nothing aside from being “anti-Trump.” Whereas in the 2016 presidential primary, more millennials voted for Sanders than voted for Trump and Clinton combined. A positive vision of the future excites us now — not an empty paean to a stagnant status quo, which seems to be all the Democratic Party is currently offering. There’s a cautionary epilogue here. The New Deal was not resistant to change; over time, the right whittled it down to a shell of its former self. Unsurprisingly, income inequality rose in tandem with the slow dismantling of the American welfare state. The lesson for those on the left is this: For real progressive reforms, a "New" New Deal won’t be enough. The most powerful social changes are those that become so ingrained and so normalized in the collective psyche that to roll them back would be unfathomable: think access to clean water, libraries, sidewalks, public higher education, and gay marriage; perhaps single-payer healthcare and universal basic income are poised to be next, if the political winds are right. In any case, the goal of the left is not just to change politics, but to change culture too. As its ranks continue to grow, the DSA may be doing just that.